Why is the Millennial generation so important? How does the Millennial generation impact the FS industry? What does the future hold for the Millennial generation and financial services? 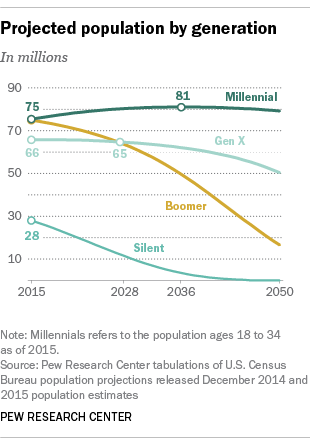 The Millennial generation is the largest generation in history, approaching 76 million in the US alone. Born between roughly 1981 and 1997, Millennials are expected to comprise half of the global workforce by the year 2020. Millennials are also referred to as “Generation Y” because they follow Generation X in the generational continuum. However, Millennials is the term most often used to describe this group in the US, whereas Generation Y is the term used globally. Millennials are digital natives, extremely comfortable with technology, and expecting it to serve them in every aspect of their lives. While they’ve been coddled by their helicopter parents, they’ve also been exposed to every aspect of the realities of the world through the Internet. And they are showing themselves to be globally conscious individuals who are committed to bettering the world. Millennials want to make a contribution―at work and in society. They are idealistic and enthusiastic, yet often inexperienced in the nuances of how to be successful within the corporate environment. However, they don’t necessarily aspire to be part of that environment―preferring startups and small to medium-size companies. Motivated by social factors over economic factors, they seek a life with meaning and look for the flexibility that allows them to enjoy themselves while being socially responsible. Their eclectic blend of characteristics positions them well to be superior leaders in the future and to help make the world a better place. While their characteristics have been quite well defined and documented, most of the research has been focused on Millennials in western culture, and the US in particular. That being said, the Millennial mindset appears to be a global phenomenon. As the largest generation to-date, and the generation that now dominates the workforce, Millennials are the customers and employees of the present and future. They will have a profound influence over both the marketplace and the work environment. This fact should be especially concerning to the financial services sector, considering that a 2016 Accenture survey of recent and upcoming US college graduates indicates only 7% of graduates-to-be are interested in working in banking and capital markets and only 3% are interested in working in the insurance sector, with only a 1% improvement between the years of 2014-15 and 2016. This lack of interest, compounded by the growing shortage of qualified industry talent, presents a significant challenge to financial services firms. On the up side, indications are that Millennials are serious investors. However, more than any other generation, they have a profound distrust of the financial services industry―which should be of great concern to financial services firms when it comes to attracting Millennials as customers and employees. Millennial wants and needs are inspiring a new type of more flexible employee experience that takes into account individual preferences. Millennials are asking for products and services that are more self-driven and work well within the digital world. Millennial consciousness has the potential to drive an ethical transformation within the industry. Tradition and convention in the workplace has little to no meaning for the Millennial generation. They believe everyone has an equal voice, regardless of their tenure, and people should be evaluated based solely on what they bring to the table―not how long they’ve sat at it. While this attitude can chafe with older, more experienced workers, Millennial energy, willingness to learn, and eagerness for developmental feedback provide ample opportunity for them to make a valuable contribution to any workplace, if properly managed. For example, new college grads entering the workforce tend to be very passionate about and prepared for their career. They also tend to take their responsibilities very seriously. And while they may not be committed to staying with any one company long term, they will work hard while they are there. Not only that, if they are developed appropriately, supported in their time on the job, and engaged in the work that they do, they are more likely to stay, or to come back after they leave. Financial rewards are not the overarching factor in Millennial job choice. Their greater desire is to make sure their talents are being well-applied and that there is social value in what they’re doing. In fact, companies with a reputation for social responsibility are high on their employer choice list. Given financial services’ negative reputation in recent years, this is an element firms will need to pay particular attention to when marketing themselves to Millennial workers. And, the effort needs to be more than a marketing ploy. It must become part of the company culture. It will require concerted efforts to court and keep this generation of employees. By their sheer number alone, Millennials are positioned to be a significant influence within the financial community. They will exercise influence not only through their own wealth accumulation but also through the capital they stand to inherit from their well-off Baby Boomer parents and grandparents, though there is some evidence that the value of inheritances overall may be diminishing due to longer life spans and the increasing cost of retirement living. The very good news is that Millennials are proving to be committed, albeit conservative, investors. Fifty percent of recent and soon-to-be US grads state public perception is the most influencing factor in choosing to work for a particular company—which is not surprising, considering the importance of social responsibility to this generation. However, this preference poses a particular problem for many financial services firms, given the public perception around their role in the global financial crisis (GFC) and the concerns that have been raised in many countries by the media about their conduct and culture in the years following the GFC. The financial services industry as a whole will be challenged to overcome this distrust in order to take advantage of the many opportunities for business growth this generation presents. However, if financial firms are successful at attracting and retaining Millennials, these new employees can help turn the ethical tide within the financial services sector. Simply by participating in the industry, Millennials have the opportunity to infuse it with a social conscience. Capturing and keeping Millennials as both customers and employees means meeting them on their own terms, including going where they are (online) and delivering on promises made, whether to prospective employees or new account holders. In the workplace, Millennials are looking for rewarding work with opportunities to grow and contribute. They want an employee experience that includes a personal connection with coworkers at all levels, the flexibility to get the job done in the way that works best for them, and experiential learning and growth with the goal of making a purposeful, meaningful, socially responsible contribution. Financial services organizations need to think carefully about how they manage young people, including those who leave the organization, and be more supportive of them in trying new things outside of the organization so they will be more likely to return in the future―bringing back new experiences, skills, and perspectives. Firms that can offer that type of employee experience as well as develop compensation packages that address Millennial needs (for example, home buying and investment goals) will be much more attractive to this generation than firms that stick by old standards and traditions. Financial services firms that take the time to understand this generation and create products and services that meet Millennial preferences stand to gain considerably over time. Providing robust, collaborative online education and investment tools and resources that allow Millennials to make better investment decisions will help build a bridge between Millennials and the financial services community. Financial services firms also have a significant opportunity to create trusting relationships with this group while growing their business by helping Millennials create investment strategies that take into account all of their life stages, as well as the wealth they are soon to inherit. Attracting and retaining Millennials as employees and customers is about more than just transforming the workplace to make it more inviting for a new generation or offering more online services to Millennial customers. As this generation progressively dominates the workforce and the marketplace over time, its influence will be transformative. Businesses that cannot attract and appropriately reward and retain high-performing Millennial employees will undoubtedly suffer in the long run. Firms that continue to follow an old-style customer service and product-based approach will find themselves left behind in the financial services marketplace. The companies that will lead in the future will instead reflect the best of this new generation—purposeful idealism that does not preclude financial success, commitment to social responsibility, and a more egalitarian, inclusive, and enjoyable business environment for all. How well is your firm doing at attracting and retaining Millennial employees and appealing to this new generation of customers? What else would you like to know about the Millennial generation? Feel free to share your thoughts in the comments section below, or email me to discuss how Accenture can shed more light on the relationship between Millennials and financial services, and the impacts of that relationship on the industry.